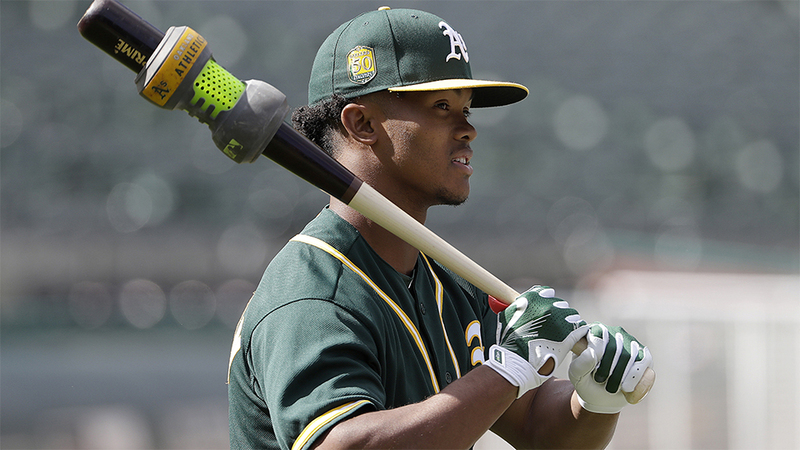 A's first-rounder Kyler Murray announced Monday that he would declare for the NFL Draft. According to ESPN's Adam Schefter, many project the Heisman Trophy winner as a first-round pick. Tweet from @TheKylerMurray: I have declared for the NFL Draft. The A's were expecting their fourth-ranked prospect to declare, the San Francisco Chronicle reported last Wednesday night. The report coincides with news that Oakland has invited the former University of Oklahoma standout on the diamond and gridiron -- fresh off adding a host of awards to his trophy case, including the Heisman -- to Spring Training, which begins Feb. 15. in Mesa, Arizona. This does not mean Murray, who signed a $4.66 million deal after he was selected ninth overall by the A's in last year's Draft, is finished with baseball. He would not have to give back his signing bonus simply by declaring for the NFL draft. However, the biggest hurdle for the 21-year-old ultimately joining the Oakland system is the NFL combine, which starts Feb. 26. Should he report to big league camp and let his play on the gridiron speak for itself, he could delay his final decision until spring. The NFL draft begins on April 25. Murray passed for 4,361 yards, rushed for 1,001 and totaled 54 touchdowns in 14 games for Oklahoma. Murray's agent, Scott Boras, has maintained his client would end up sticking with baseball, doubling down on the stance at last month's Winter Meetings. Since then, Murray and the Sooners fell to Alabama, 45-34, in the college football semifinals, but hype has persisted surrounding the continuation of his football career. During his junior season at Oklahoma, Murray posted a .296/.398/.556 slash line with 10 homers and 47 RBIs in 51 games while displaying his speed on the basepaths (10 stolen bases) and in center field with impressive range (.991 fielding percentage). Last month, Murray told Sports Illustrated, "I'd like to do both [football and baseball] if possible. But I don't know how possible that is." While playing both sports professionally seems unlikely, one thing is becoming clear: the chances of seeing Murray in the Minor Leagues this year are becoming less likely.